I was having a conversation with Auntie yesterday. It was about an SUV on a street behind my building that had, apparently, started down the block, gotten stuck and finally just been abandoned (pictured). This wasn't an unusual occurrence yesterday, or, frankly, today. 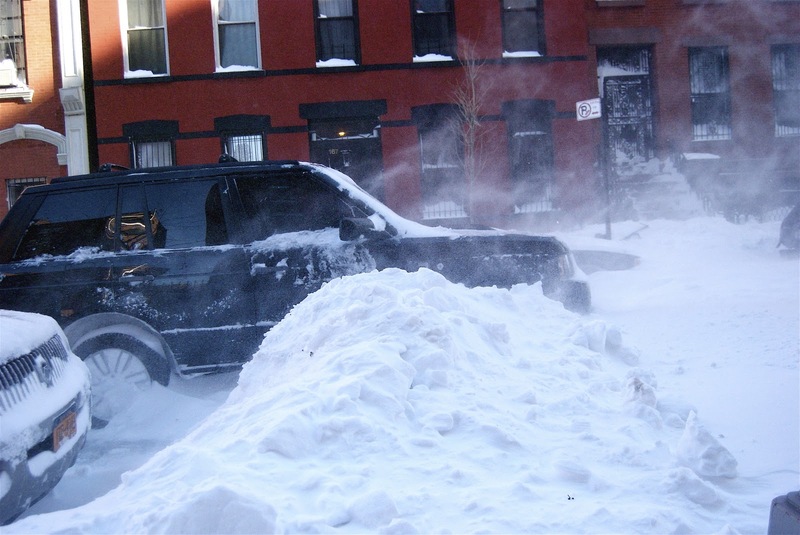 Stories of SUVs, buses, even city plows just left behind were all over the blogosphere. People have been stuck on subway trains for as much 32 hours. The more we talked about it, though, the more incensed Auntie became. Why hadn't they called the police, the fire department or a neighbor? For my part I didn't understand why she even thought that was an option. I explained that the city agencies were overloaded and how many people were stuck in how many places and how the stores were even sold out of shovels at this point even if they were open and I could almost see her sit back. She said she'd shoveled herself a fantastic workout to clear her house and car then taken the drive to Dunkin's for granted. So now it occurs to me that you might all be wondering about this sort of thing. Or you might not know to wonder. Or you might just skip this post and go to another one. It costs about $1 million per inch to clear the snow in New York City. With 20 inches of snow even I can do the scary math for a city slashing services without mercy and still unable to balance the budget. It means 12 hour shifts for sanitation workers and an intricate plan for which streets get priority and what order to plow them in. It means postponing garbage pick up and canceling many parking regulations. The MTA takes care of the subways, which aren't entirely underground. However, if a train goes above ground near the end of the route and the above ground part gets snowed under then you have trains backed up behind that. Don't even get started on the trains that come above ground briefly then go back under. Oh and the trains are run with electricity and snow is water so...there's that. The individual citizens have a bunch of responsibilities as well. 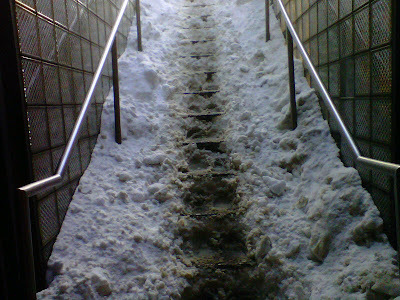 Each land or shop owner is required by law to clear the sidewalk in front of their buildings or face a fine. Eventually the parking regulations will return so car owners are required to dig out their cars by the time that happens or face tickets. Citizens are asked to clear around fire hydrants near their homes or businesses. That is, of course, a socialist sort of thing where you certainly don't have to clear them out but if there were to be a fire and the FDNY couldn't get to the hydrant or had to take time out to clear the hydrant before attending to your flame-engulfed dwelling....well, it just might be in one's interest to participate in the conspiracy to overthrow American values this one time. OK, now for a visualization exercise. 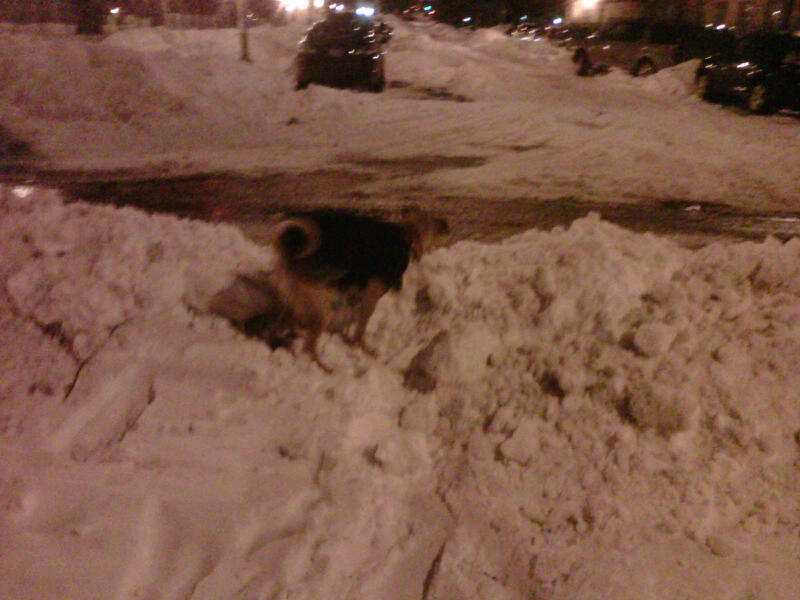 Picture that there are 3-5 foot drifts of snow (if you're having trouble check out the photo above of my dog standing on top of one this morning). Picture a plow going down a street with cars parked on both sides. Now picture that the people who own the cars that have recently been plowed further under are required to dig those cars out. Where do they put the snow? They can toss it toward the sidewalk, which may or may not have been shoveled to some extent, but they probably walked down that sidewalk to get to their car and will probably have to walk back up that sidewalk to rest their weary bones after they clear out the car because they still can't really drive anywhere. Alternatively, they could toss it out into the freshly plowed street. The sanitation department has been whining all week about that, "Don't throw the snow in the street or we'll just have to plow that street again and we might never get to those side streets you're tweeting and facebooking and blogging about. Quit it!" Seriously, they need better PR people. In a lesser snow storm with more car traffic you can usually toss the snow from around your car into the street and the friction from passing vehicles will melt it and all will be well. In a storm like this? Not so much. Some people manage a sort of snow fort feat of engineering where you make taller walls of snow around your car with a kind of doorway to drive through. It's kind of precarious, though, and I have no idea how you honestly drive safely in or out of such a thing. Pony Express once tried to explain socializing in the city to someone who lives somewhere that's else. She talked about how it's possible to have a very close friendship with someone here and never to have seen the inside of that person's home. Transportation (even at its best) being what it is, homes being the size they are, neighbors being who they are, city dwellers often meet up at bars and restaurants and parks instead. It seems more fair to meet somewhere that's halfway between two homes than for one person to do all the traveling. We use shared space more often, I think, and we have much more of it to use. It's similar in blizzard recovery. In a smaller town or city there's more delineation between what is the individual responsibility and what the municipal. You take care of your part, I'll take care of mine and when we're both done we'll both be able to safely navigate the labyrinth of solid, white water. Here we're intertwined to such an extent that it can take a little while longer to untie the knot. Not always but sometimes. Make no mistake, I'm still angry at our smug, lying mayor. I'm still incredulous that a city agency that left passengers stranded with no information for more than 30 hours on a subway train is going to raise its rates enormously in two short days (photo above is of the most treacherous part of my commute today, the stairs into the Nevins Street station, untouched by a shovel of any kind, leading into a station with no station agent). I'm also a little frightened about what could have (and probably did) happened while emergency services were (and continue to be) so compromised. But I've seen this before and I'm sure I'll see it again and I'm just hoping we'll do better next time. I recall a snowstorm in the 1970s, walking up the center of a completely untouched Fifth Avenue at 10th street, making the first footprints in 2' of snow. It was beautiful. I think in general NYC does better than most cities, but this time was a wallop. Maybe it has to do with the fact that it stayed cold and the snow stayed? Most of the time in Mid-Atlantic places if there's a snowfall the temperature actually rises a tad, and the snow melts sooner - that was the case this Thanksgiving week in Seattle, for example. What an adventure you're having. Believe me, I am looking at all the photos and being glad that my 22 y o son is no longer living in Brooklyn - he was snowbound in London, which, other than the airport, seemed to have handled it better than NYC this time. I was out of town for the blizzard, and very happy to be able to get back in to LaGuardia on the 29th. My in-laws were in town, however, and had their parked car swiped by a plow - it'll take 1.5K to fix. A friend of mine in Brooklyn e-mailed me a picture of a fire engine that got stuck in the snow on their street. Hopefully it was on the way back from an emergency, not on its way to an emergency. It took a backhoe pushing the fire engine from behind to get it unstuck. That said, I like blizzards in NY - especially when the streets are closed and everyone walks down the center of the streets. But I hate the dirty snow afterwards and the huge puddles of freezing cold water on every corner when the snow starts to melt. Petty. But Humorous. That's Me.